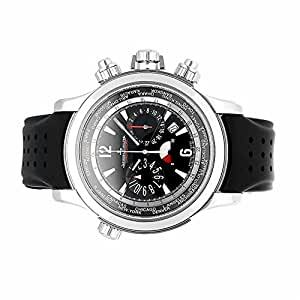 Pre-OwnedÂ Jaeger-LeCoultre Master Compressor Extreme World Chronograph (Q1768470) self-winding automatic watch, features a 46.3mm stainless steel case surrounding a black dial on a black rubber strap with a stainless steel tang buckle. Functions include hours, minutes and small-seconds, date, chronograph and GMT. This watch comes with box and manual. We back this watch with a 15-month warranty!